Erinific – Stuff that happens in my life. Update your bookmarks/subscriptions/etc. and please join me over at readwritewine.wordpress.com from now on! The Rick Riordan books were a bit of a struggle to get through. I loved the Percy Jackson series, but this one just doesn’t do it for me. I read them more so because they were in the house and I needed something to read, rather than because I was really interested in them. The House of Hades took me a couple of months to finish because I kept putting it down and starting something else. The Shopaholic books were a bit of a surprise. I found them all on the used books rack at my library, so I grabbed them and figured I could fly right through them and quickly add three books to my list. I actually enjoyed them! The first one is my favorite, but the other two were cute and entertaining as well. As I mentioned above, I bought A Mango-Shaped Space simply because there was a cat on the cover, the book was in really good condition, and it was super cheap. Even if I hated it, it was worth a quarter to find out. I had no idea what it was about, but I ended up loving it. I’m a sucker for animals, especially books about cats, and this one did not disappoint. I don’t really want to say anything about it because it is so unique and lovely, and I want you to just pick it up and read it blindly and then fall in love like I did. I’m not setting a reading goal for 2015. I have a bunch of Sailor Moon manga that I want to read, and I felt like with all the pictures, they wouldn’t count as actual books. However, I do still plan to read as much as possible. In fact, my husband bought me Fangirl, Attachments, and I’ll Give You the Sun for Christmas. I’ve already started Fangirl and am having a hard time putting it down to go to sleep. Tomorrow is October first. The leaves are starting to change and cover the ground. The sun is setting earlier and earlier with each passing day. The temperatures are dropping, resulting in needing heat in the morning, air conditioning on the drive home, then heat again at night. It’s almost time to pull out the sweaters and faux fur-lined boots! Dunkin Donuts is selling pumpkin muffins! Apples are on sale every week at the grocery store! To me, Fall means comfy clothes and yummy food. The problem with this is that I have completely fallen off the healthy eating/Weight Watchers bandwagon. I’ve only been making a pitiful attempt to track: if I don’t know the points in something, I don’t track it. I’ve been eating as much as I want of whatever I want, whenever I want. Needless to say, I’m not feeling too hot physically or emotionally, and I can barely zip my pants (no, seriously). I told myself at the beginning of September that I would strictly follow WW until the holidays so that I could get back on track, feel better, and then not feel horribly guilty about stuffing my face with first candy, then turkey/potatoes/mac and cheese/pie, then cookies and cakes and more candy. Not to mention the wine. The holiday season is just not complete without wine. 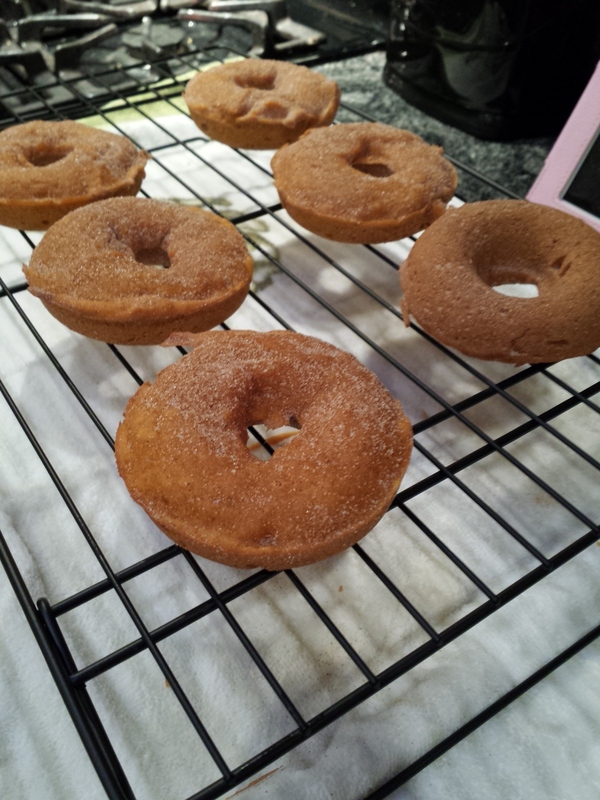 Those are homemade pumpkin donuts coated in cinnamon sugar. They are only 5 points each, which really, is not as bad as they could be, but that’s still 5 extra points that I don’t need every day. The recipe made EIGHTEEN of these delicious wonders, which is great, except I’m the only one in the house who will eat them. To be fair, hubby did taste them and said they were good (but he wasn’t interested enough to eat an entire one). I ended up dumping most of them because I would have had to eat, like, three per day before they started to go bad. I’m starting over tomorrow morning. I stocked up on yogurt and apples and bananas and chicken breasts and seltzer and Diet Coke. I have veggies in the freezer and plan to get in as much walking as possible before the sun starts setting at 4:30pm. I’ll clean off the elliptical and force myself to use it when it gets too dark and cold to safely go wander around outside. I will get back on the wagon and I will feel better. I was a little resistant to read Divergent, only because everyone has had such high praise for it and I was afraid of being let down. People have likened it to The Hunger Games, and after reading it I have to say that I agree. I haven’t seen the movie yet, but I have obviously seen the reviews so I had a hard time not picturing the actors in my head as I went along through the story. In the author’s imagined world, society is broken down into five groups: Abnegation, Candor, Dauntless, Erudite, and Amity. On one day each year, all sixteen year olds must take a test which determines their rightful place in the world and then they have to decide whether to follow the test results or break away into a group of their choosing. Beatrice was born into a Abnegation family and has lived by their rules for the past sixteen years, but she can’t help but feel that maybe she truly belongs elsewhere. Her choice will affect not only her, but her family, and even society as a whole. This was definitely a page-turner. I had a hard time finding stopping points late at night when I knew I had to go to sleep if I had any hope of functioning at work the next day. Often I had to just force myself to stop, and then I would pick it up at lunch the next day or as soon as I got home from work. I thought the premise was original and the storyline unfolded at a good pace. There were a lot of cliffhangers and surprises, some of which were easy to figure out in advance, but that didn’t detract from the overall story. The characters were well written and likable — for the most part. I enjoyed this book so much that instead of borrowing the sequels from the library, I’m just going to purchase the set. I have been told by various people that the last book is disappointing, but I’m ok with that. This is definitely a series to own. Looking for Alaska is basically the exact same book as Paper Towns, except in a different setting and the characters have different names. That being said, I actually enjoyed this book – until the very end and John Green’s need to ruin a good thing with lots of forced depth and introspection. Also, did we have to read such detailed accounts of the kids smoking every couple of pages? Lame. Miles “Pudge” Halter decides that he wants to go away to boarding school to find the Great Perhaps. What he actually finds are a roommate nicknamed The Colonel and the completely-unattainable-yet-tragically-flawed girl down the hall, Alaska Young. Of course she has a boyfriend, and of course Pudge falls for her and thinks he may actually have a chance with her. All of the characters are unrealistic in that super-intellectual-beyond-their-years Dawson’s Creek way, except less charming and less likable. Long story short, Alaska dies and Pudge and his friends spend the rest of the book playing detective to try and figure out whether it was an accident or a suicide. The saving grace was that I felt like I could relate to Alaska – not that I am anything like her, aside from the fact that I understood her guilt and anger and emptiness. That part of her character was very well-written and believable. The rest of her was annoying and snotty and entitled, which I suppose was the author’s attempt to make her more true to life. Sure, she’s gorgeous and everyone likes her, but she’s not perfect. She’s mean and uses people and doesn’t really care about anyone except for herself.